Home to a variety of plant and flower species, the pyramids provide an opportunity to learn and see something new every visit. Experience the pyramids with other adults. There will be themed tours and dinners, how-to classes and more. Find admission rates, hours of operation, and membership rates for annual passes. Familiarize yourself with facility guidelines and etiquette before you arrive. Find the Muttart Conservatory map, directions and parking information. Join a guided tour, explore at your own pace or participate in a drop-in program. Learn something new about the natural world while enjoying the beauty of the pyramids. Step inside the Pyramids where different climates are home to various plants, flowers and trees. 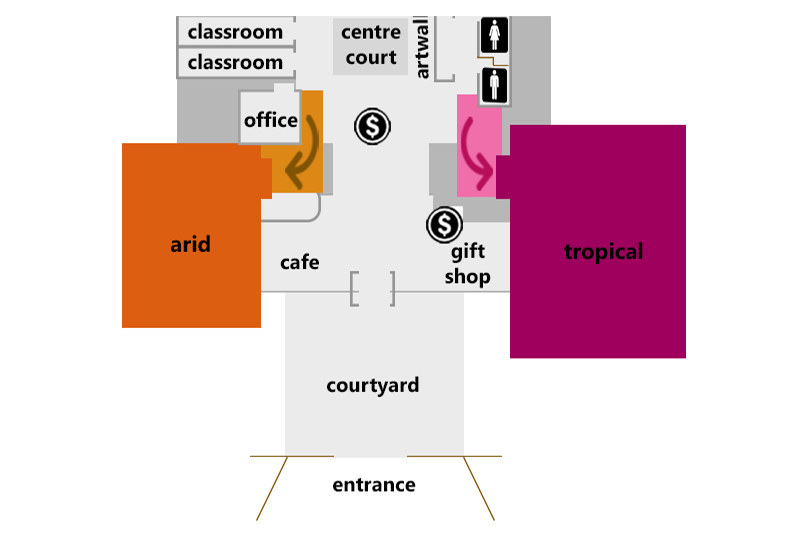 Map of the layout of Edmonton's Muttart Conservatory.